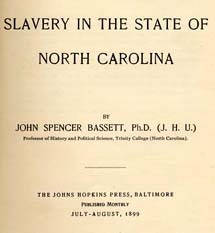 John Spencer Bassett, 1867-1928 Slavery in the State of North Carolina. Slavery in the State of North Carolina. Baltimore: Johns Hopkins Press, 1899. Slave insurrections -- North Carolina. Slaves -- Emancipation -- North Carolina. Slaves -- North Carolina -- Social conditions.